Leading off today: One day after the funeral for his 26-year-old brother Daniel, Alec Kiernan played a spectacular football game for Centereach. The senior running back and linebacker scored four touchdowns on his way to a 213-yard day and recorded three sacks among his seven tackles as the Cougars defeated visiting Riverhead 43-8 on Saturday. "Danny. Everything was about Danny," Kiernan told Newsday. "I know he was there watching." Devin Demetres returned the opening kickoff 82 yards for a touchdown, and Kiernan added scores on carries of 10 and 11 yards as Centereach broke to a 21-8 lead in the first quarter. "He's our captain. He's not a screamer or a yeller. He leads by example; he's our glue," Centereach coach Adam Barrett said. "This week was very tough, but we rallied around him." Irondequoit stays perfect: Junior Freddy June threw three touchdown passes and ran for another score as Irondequoit defeated Canandaigua 34-14 in Section 5 Class A action. Canandaigua was ranked ninth and Irondequoit 13th this week by the New York State Sportswriters Association. "We got out tails whipped," Canandaigua coach Jeff Welch said. "There's no question about that." June was 9-for-17 passing for 127 yards and ran for 182 yards on 18 carries. • Justice Griffen threw for 196 yards and a TD and also ran for a score as Eastridge knocked off No. 12 Greece Athena, the 2016 NYSPHSAA runner-up, 39-21. 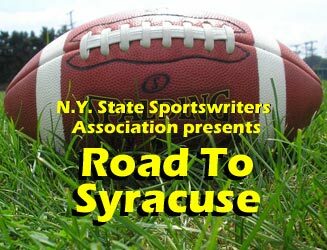 CBA escapes: Syracuse CBA quarterback SirVocea Dennis ran for four touchdowns and threw for another as the Brothers ranked eighth in Class AA, edged Elmira 40-33. Dennis finished with 120 yards rushing on eight carries. Avion Othman ran for 100 yards on just four carries and caught two passes for 64 yards. Class C rally: Down 26-14 in the fourth quarter, 13th-ranked Cleveland Hill rallied past University Prep from Rochester 30-26. Aaron Wahler's 20-yard TD run and the defense forced a turnover to set up D'Mario Grant's 5-yard TD run with :27 remaining. Bonus football: East Harlem turned back Long Island City 40-32 in three overtimes behind a combined 390 rushing yards from Taj Harvey (185), Sebastian Ramos (121) and Bennell Ellis. • Mike LaDonna ran 10 yards for a touchdown in overtime to lift West Islip past Newfield 20-14. LaDonna ran for 85 yards and completed 9 of 14 passes for 210 yards and two touchdowns. Big efforts: Gregory Pimental rushed for 282 yards on 12 carries in Freeport's 28-12 win against Uniondale. Aaje Grayson gained 186 yards on seven carries and scored three touchdowns. ... Josh Destin ran 10 times for 197 yards and three scores and had a 40-yard interception return for a touchdown to lead New Hyde Park over Jericho 48-14. Brandon DeGuarde carried 30 times for 344 yards and five TDs Friday in Wayland-Cohocton's 48-39 victory against Avon. Scoreboard: Here are the results from around the state for Week 3. More later: We'll cover some soccer, field hockey and cross country in a second blog later Sunday.